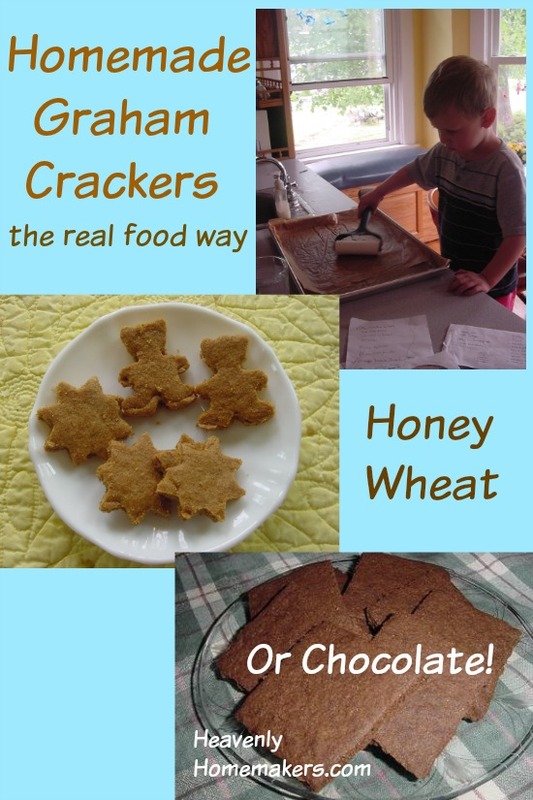 This Whole Wheat Graham Crackers recipe was originally posted in 2008. My current big 11-year old was a tiny 3-year old back then and I can’t stop looking at the pictures in this post. I updated this post to have an easy-to-print recipe option for you. These crackers are crunchy-crispy…and taste SO GOOD. Oh, I hope you love them like we do. If you like the Honey Graham Cracker recipe, you’ll love the fact that you can also make CHOCOLATE Graham Crackers! Just add 1/3 cup cocoa to the recipe. Healthy Treat for Today: Homemade Whole Wheat Graham Crackers! Melt stick of butter in a pan on the stove. Set aside. In a mixing bowl, stir together the flour, sucanat, baking powder, baking soda, salt and cinnamon. Add the liquids: honey, water, vanilla and melted butter. Stir well until a nice ball of dough is formed. Cut two pieces of Parchment paper the size of the cookie sheet. Lay one piece of parchment paper on the cookie sheet. Place the ball of dough on the parchment paper. Lay the other piece of parchment paper on top of the ball of dough. Squish dough down a little with your fist. Use the rolling pin to roll the dough between the pieces of parchment paper. Roll until the dough covers the whole cookie sheet. Remove the top piece of parchment paper. Cut rolled dough into 2 inch squares, or cut shapes with cookie cutters, being sure to separate the shapes from the surrounding dough a little. Bake in oven for 18 minutes. Turn oven off, but leave crackers in the oven to get crisp. Remove from oven after 30 minutes to one hour. Break graham crackers apart. Malachi is finishing up the rolling for Mama! cut into squares and ready to bake. Malachi is using little cookie cutters to make “animal crackers”! Here’s a plate of the Chocolate Graham Crackers. Yea! I’ve been waiting for this recipe… as my kids are finishing our (hopefully) LAST box of bad-for-you graham crackers. We’re going to give them a try! OH, I am super excited… I tried a recipe from another cook book I have, and they were OK to slightly NOT OK! I can’t wait to try these as there are NO Grahm crackers without hydrog. oils… except the Organic ones I buy that are $4+ a box.. OUCH! I will try these tomorrow and let you know how they turn out! Oh yummy! EVERY time you post a new recipe for baked goods it makes me want to go whip it up right then!! We have about 1/2 a box of store bought graham crackers to finish up and you can bet I’ll be trying these – probably the chocolate version!!! Oh boy Oh boy Oh boy!!!! I can hardly wait to try these!!!!!!! ….and chocolate too!! Be still my beating heart! Every recipe that I’ve tried of yours has been great so I know this will be too! Thank U so much 4 taking the time to share it with us! Love the little roller that Malachi is using! I can’t wait to try these, too. I’ve never heard of rapadura (sp?). If I can’t find it what can I use that will still be good for you? Thanks! Thank you so much!! Your healthy cooking is so encouraging. When I’m drawing a blank for something new to serve, I almost always look here first because I’m pretty sure I won’t have to compromise! Oh those look wonderful! I’m currently annoyed that NONE of our many local health food stores carry rapadura. We will probably order it online soon. quick question (that I didn’t think of in time for my first comment): I saw that you like the Sally Fallon book “Nourishing Traditions.” What is your opinion of soaking grains and such? yeast vs. sour dough? I tried doing several recipes and we just don’t like them as much. However, I’ve found that some things do better soaked, like muffins and pancakes. I do soak our hot cereals most of the time. But I can’t bring myself to give up our favorite whole wheat yeast bread recipe. Anyway, we have noticed improvement in digestion with just the few things I have changed…I just don’t see the harm in not changing everything… What do you think? Sara, I use sucanat. I think it’s basically the same thing, plus it’s a little cheaper. These sure look like kid would love them! I’m definitely going to try this recipes, especially the chocolate version. My kids love Puffed Wheat Squares, so I’m sure they’ll go for these healthy snacks too. I will have to try to find rapadura, I’ve really never heard of it. Is is possible to substitute cane sugar here? I too am wondering about substituting with the organic cane sugar that I have a ton of already. I’m also wondering about using graham flour. The graham cracker recipes I have call for graham flour and I have some on hand that is organic. Thanks! These look great! I have never heard of rapadura before. Everything else, though, sounds really easy! I’m going to have to give this recipe a whirl! For everyone wondering if you can substitute another kind of organic cane sugar for the rapadura…absolutely you can. You can substitute regular white sugar if you want to! I just use and recommend rapadura because it’s such a healthy sugar! Thanks so much for this recipe!!!! Have I told you lately how much I love your website? You’re helping this mama learn to cook! These look great! I can’t wait to try them. I’m gonna try it very soon!!!!!!!!! My Alex is the biggest graham cracker fan ever! He will just love these. And all of the kids will have such fun helping to make them. Thanks Laura! Thank you! You know I am going to have to try this. I made your yogurt and cream cheese this past week and it turned out fabulous and it could not have been easier. Truly, thank you so much for all you do. You have been a great help and source of encouragement for me as I delve into this new world of cooking from scratch. Kids loved them, perfect for that little sweet treat after a meal and they keep well in a cake plate. I did chocolate (of course) and I’ll try the regular ones soooooon! Thanks Laura! Wow! These look great! I’m going to try them substituting Spelt flour as my daughter is gluten-intolerant but can tolerate spelt. We’ve been buying an EXPENSIVE mix from Allergy Grocer for Graham Crackers. YAY! I just made these today and they were GREAT! I used Splenda because DH is diabetic and I rarely use regular sugar. I thought I read somewhere that you use the “scraps” for pie crust. How do you store them until you’re ready to use them? Freezer? And do you leave them whole or crumble them? Thanks! What size pan did you use? I tried on my large cookie sheet and I had a very hard time getting the dough to reach all the edges. Mine are in the oven now, we’ll see how they turn out! Thanks! It took me long enough, but I FINALLY made these amazing cookies. They are SO delicious. I like our crackers just a little thinner, so we used one regular sized sheet pan and one small and set the cooking time to 14 minutes. The parchment paper is definitely a blessing!! These went together quickly and easily. Using the parchment paper and the small hand roller (like the one you have in the picture) made it smooth out like a breeze. THANK YOU for the recipe!! It’s going to be making regular appearances in our house! How long will these store in an air-tight container? Hi Laura, lurker here ;-) do you have a SOAKED recipe for graham crackers?? These look wonderful. I have a cheesecake recipe web site and of course I use a lot of graham crackers when I make various cheesecakes. I might have to give this recipe a try. I found these crackers in my search for allergy friendly baking project to do with my class(no nuts, milk or egg). 14 kindergarten students agree that these are “delicious”, “fantastic”, “yummy” and “better than chocolate”. Thank you! I cut these out with cookie cutters and laid them out as cookies, rather than a sheet of crackers. It was very easy to reroll the scraps and cut out more shapes (though transfering the shapes to a cookie sheet takes a careful hand). The recipe made about 50, 2 1/2″, stars. I just baked a batch of these and can’t wait to dig in. My kids will be excited for these tomorrow….might even spread some peanut butter across them. Thanks for sharing, Laura! hey there! thanks for this site!! these look so yummy!!! how much is a stick of butter? kind of a dumb question but i dont know haha. Thanks!! 1 stick of butter equals 1/2 cup. I’m on a restricted diet- can one use canola oil instead of butter ? Or something else and come up with the same results? I’ve never tried oil in place of butter, but I don’t know why it wouldn’t work. You may want to use a slightly smaller amount. My daughter and I just made these. Yum! Thanks for the great recipe. I’m sure we’ll be making these often. Very yummy looking. Can’t wait to try them! Just made these and we all loved them. I think my cookie sheet must be smaller because my crackers were kinda thick and a little chewy. Next time I think I’ll use the cookie sheet and a smaller bar pan. We make a version of homemade graham crackers as well and they NEVER last very long around here! I love the pictures of your little one’s helping! These look great – thanks for sharing! How embarrassing that it took over a week to comment on your post! Your site has even changed its clothing since I first popped by. Neat! Graham crackers are tops on my list of a new MFS item to try. I really appreciate you linking up to the Un-Processed foods Carnival; it will be a valuable resource that I will direct my readers to often! Yes, you can use the same amount of sugar for the rapadura! I just discovered your site last night and love the recipes. I am a SAHM of 2 young girls and love to bake with them. I just put this in the oven after some help from my 2 year old. they smell yummy already – my 3 year old would love them with chocolate so that’s next on the agenda – maybe this afternoon so we have a variety for our playdate today! I subbed sugar in the raw since that’s all i have but need to get some of the stuff you have. sounds good. off to whole foods I go! Thanks – i look forward to trying more of your recipes soon! Ok, so looking through your recipes and choosing some to use, I am totally new to rapadura and sucanat. How are they different and what do they replace? Rapadura and sucanat are basically the same as each other: Dehydrated cane sugar juice. It’s the healthiest form of sugar. Rapadura is a name brand for sucanat, making it more expensive, so I now usually get sucanat. I’ve spent the last ten years simplifying my house and am now moving on to simplifying my food. When I saw all the stuff in graham crackers that I didn’t want anymore, I stopped buying them. Thank you for this recipe. I am working on simplifying our food choices and I just made this for our freezer cooking/baking day and shared it with my readers! They were very good although next time I will try to roll them out a bit thinner! Oh, I am so excited to try these. I love your Pampered Chef rolling pin. Now you just need a Pampered Chef stoneware bar pan! Silly question – I was looking at the Amazon link. Is sucanat like a brown sugar version of turbinado? Sucanat is “dehydrated cane sugar juice”. It is sugar processed in a way that preserves most of the nutrients. It’s quite a bit more nutritious than turbinado. But, in this recipe, the sucanat could be substituted with brown sugar or turbinado if you like and the result will still taste yummy! made these and posted to my blog. thanks for the recipe! Next time, I will divide the batter in half, putting half on each pan. I prefer mine a little more thin. They were still quite yummy, though. They were also a super easy recipe. I made these today and the whole fmily gave them a thumbs up! I did sprinkle cinnamon sugar on top. Will have to try the chocolate version too. Thank you! Thanks for the recipe! We loved the graham crackers! I posted a link to your recipe from my blog. I tried something a little different this time. I divided the dough in half and am cooking it in two batches. I prefer my crackers to be a little more thin. I tried to adjust the cooking time. They’re in the oven crisping up. I have GOT to try these. My son loves graham crackers and I really want to make my own. I have been looking for a recipe to make my own graham crackers. I love eating them and will go through a store bought box in no time. Making my own will be so much better and healthier. Thanks!! I made these today and they are so yummy. I used part white flour and part white whole wheat flour and I also used brown sugar in place of the rapadura and they turned out really good. Thank you for the recipe. Have you ever tried freezing these? Do you know how long they keep in an air tight container? I haven’t, but I’m sure they’d keep for a long time in the freezer. I’ve kept them in a jar on top of my fridge for over a month before and they do great! I just want to know how anyone could keep these over a day! They are so amazing!!!! Thank you for the recipe!!! What’s the advantage of using sucanat over honey? Could I use honey in your recipes containing sucanat. I’m excited to see this recipe, I’ve been wondering how to make graham crackers w/o lots of junk in them! Made these yesterday and they were a huge hit! I’m thinking about mixing in some marshmallows and chocolate chips and turning them into “s’mores cookies” Not healthy, but sounds so good! Thanks for the recipe. these were so delicious!! my kids loved them and they are super picky! so happy to find recipies for making my own snacks and not buying processed stuff. yum! I know that you grind your flour, but I have started using “graham flour” that is whole wheat from King Arthur or Bob’s Mill and it makes them so much more like the store bought ones. I make these every week. Thanks for the recipe!!! A friend of mine told me about your recipe for homemade graham crackers – I made them yesterday for a preschool playgroup and they were gobbled up in no time! I couldn’t find sucanat in the grocery store, so substituted with organic evaporated cane sugar. These are AWESOME! Thanks so much for the recipe. We also tweaked them a bit. My boys like to pretend they are making the Gingerbread Man, so they get to each use a gingerbread man cookie cutter. I like to use a small cookie cutter (about the size of a teddy graham). It takes a little while to cut them out, but they don’t take long to bake and crisp. This is an easy and portable snack. I’ve found that it’s easiest to roll in batches between plastic wrap. I have made these crackers several times now, and my boys LOVE them! The first time I made them I cut them before baking and found that they baked together and were difficult to break into squares. The next time I made them I forgot to cut them before baking, so I used a pizza cutter and cut them into squares when they finished baking and then slid them back into the oven to crisp up. So easy! So yummy! I made a batch last week and they made the best graham cracker crust ever. I think I’ll be making these a lot. Way better than store bought. I’ve made these, and they’re delicious. My question is can I use the raw dough to make the graham cracker crust that is normally called for in cheesecake recipes? Instead of the usual method of crushing the cookies, adding sugar and then melted butter…as the sugar and butter are already part of the ingredients. Has anyone tried this? Not only do I save time, but also I cut out the extra calories as there will be enough with the cheesecake filling. I think I’d probably bake them, then crush them, but not add the extra butter and sugar. They’d be sweet and buttery enough…but I would bake them first so you’d have the crunchy consistency of a graham cracker crust. I’ve not tried soaking this recipe or the strawberry bread. I think there is a way, I’d just need to play and figure it out. If ever I do and it WORKS, I’ll be sure to update the posts. I was wondering if you ever had a chance to try these soaked? My hubby’s going on a road trip next week and these would be a good snack so if I have time I want to make a stab at it. Thank you SO much for sharing this recipe! I stumbled upon it by accident a few months ago and have been making them ever since. My boys love them (I have four too!) and it had never occurred to me to make my own. I linked to this post from my blog today, because I wanted to share your wonderful recipe. Love your blog and thanks again! Could i use regular sugar instead of the cane sugar juice extract? Yes, just sub one for one. Which is better to use sucanat or rapadura? I’ve never cooked with them. And is organic pure cane sugar the same? Thanks for the yummy recipe. I used half the amount of sugar and honey and they still tasted great. I did add a little more water and I sprinkled cinnamon and sugar on top. My boys (1 and 3) love these treats. I’ve not made them with exclusively coconut oil, but I don’t know why it wouldn’t work. Yes, do a 1:1 exchange! Could you not pipe (or plop) them onto the parchment paper like you do the vanilla waffers? The consistency of the batter may not allow you to do this but it sounds easier to me. I think the dough is too stiff to pipe. Rolling and cutting these isn’t too difficult. Hi. We love these crackers! My daughter (she’ll be three in March)and i bake them often. I’m always trying to add protein where I can so swapped out half a cup of whole wheat flour for chickpea flour. Can also swap out another half cup of ww with amaranth flour too. Also use less sucanant and less honey still yummy. I’m going to dip these in chocolate and give them out as Christmas gifts!! would i be better off using regular sugar, or maybe agave or just more honey for the sucanat? I don’t have any sucanat on hand..
I’d say either more honey or regular sugar – brown sugar preferably since it’s not bleached! If I wanted to make these in cinnamon, how much would I add? Also, is organic evaporated cane juice sugar any good? I’d probably add a teaspoon of cinnamon. Evaporated cane juice sugar is better than regular ol’ white sugar for sure, but it’s still quite processed. Dehydrated cane sugar juice is what I use, which is still brown and a lot less processed. If I don’t have parchment paper should I use tin foil on the bottom of the pan or should I just not put anything? I’d say just butter the pan VERY well…or use waxed paper if you have some! will raw cane sugar work for these, or does the sugar crystals need to be smaller? Yes, it should work fine! I am going to make these and blog about them on my site. I LOVE graham crackers but haven’t bought them for a long time since we are trying ot go more homemade. I wondered though do you have a post about agave, what is your opinion of using agave instead of honey? Yes, I addressed agave nectar here: http://heavenlyhomemakers.com/the-most-nutritious-sweeteners. I prefer honey. Have you made this recipe to be gluten free? No, I’m sorry that I haven’t. If you figure something out and can share, that would be great! What is this roller you have your son using in the picture and where do I find one? I got that roller from Pampered Chef. I LOVE it! if you make them into animal crackers with cookie cutters, do you leave them in the “excess” dough to bake? or do you pull them out like cookies and bake them separately, re-roll the dough, etc? can’t wait to make these with my son! i feel like a loser as so many people have expressed success with these… but they did not work for me. I doubled the recipe and then still had to grind more flour as the dough was so sticky/wet. Then I rolled them out between parchment papers but everything we cut was still too soft to lift off without breaking apart. I gave up on the cut-outs and just tried to make graham squares which then burned during the crisping phase. ugh. Very good! The whole family loved them. To make them chocolate, just add 1/3 cup of cocoa. Just pulled mine out of the overn…yummy! Yum, they smell SO good!! :) I’m waiting on them to crisp up… I used Hard White Whole WHeat Flour as it contains the same protein and nutrient value that Red/Brown Whole Wheat does, but is better for pastry cooking etc. I’m SO excited you shared the recipe and I found it! I think it was linked to another blog or something!! I’ve made these more times than I can count. I’ve substituted molasses for the honey and I rarely use all the water. I just add slowly until they’re the right consistency. Much crunchier that way. Also, I always double the recipe and they still barely last the week! I made graham crackers years ago from a recipie in maybe Laurel’s Kitchen cookbook? – turned out great and used them for a crumb crust. Glad to find this one. Have you tried to add ginger to these? I love ginger and would like to try a version with some. How would you suggest adding it, what form and amount? Thanks for the great recipe. I’ve not tried adding ginger, but I would imagine about 1/2 teaspoon would do it! I knew you had to have a graham cracker recipe around here somewhere. I am SO going to make these this week! Laura, how large is your cookie sheet? Probably something like 11×15 or something like that. It’s like a big sheet cake sized pan. Our family loves these so much, I’ve featured the recipe link on our site’s “In the Kitchen” page. What a great find!! I am trying to get my kids to eat healthier and wanted to make my own snacks. They just love graham crackers, so I am excited to try this. I do have a question, as I read through the old posts I noticed a question on soaking the recipe prior. I am assuming it is the soaking of the grains. Have you tried this? I thought I might use yogurt to soak over night and still use the water the next day when making the crackers. What do you think? I haven’t tried soaking the grains in this recipe. Yes, you could try soaking the flour overnight in a little bit of yogurt then add the remaining ingredients the next day. I would think it should work! I made these for my one-year-old yesterday! she and I both loved them! I’ve shared the recipe with friends on facebook and so many are excited to try them! Thanks for the great recipe! I just made these and LOVE them. Thanks for the yummy easy healthy recipe! I just wanted to comment that I love your blog. If I was only able to pick one blog to follow it would be yours. Its funny and informative but you don’t make anyone feel bad if they don’t make things all organic and perfect :) Not to mention all your great practical recipes! This is a great one. I make them into “teddy grahams” with a tiny bear cookie cutter that was given to me. However it takes a very loooong time to do that so today I am using a regular sized car cookie cutter. And I’m going to sprinkle a bit of cinnamon on top. And I have made them using sprouted flour and regular white wheat and they turn out good both ways. This is really the only recipe I like the sprouted flour in so far. Could you use soft white and mill it at the pastry setting? That is what is use for a pie crust…it may be too fine for crackers. What are your thoughts? Thanks so much! I’m sure you’ve already figured this out, but I like to use soft white wheat in my pastries, so that’s what I did when I made them today. I just ended up using about 3 cups of the flour (it’s so fluffy after milled that I always find I need a little more). They turned out great! Wow, so great. I omit the sucanat, and they’re still sweet enough. Yes, you can put this dough directly into a springform to make e.g. NY cheesecake. I like to replace butter with 3/4 the volume/weight of oil and maybe a bit of water. It works fine here too. My European heart even allows me to replace 1/3 of the wheat with rye. Try also with 3 Tbsp carob plus 2 dried chillies, add maybe 2 tsp more oil. Let us know how they do. I tried the other night to soak, I adjusted the water to just a small amout. It seemed to work out, but I totally blew it with the cooking. Burnt!! So, I will be anxious to see your recipe. They are fantastic cooked normally!! I think I even put coconut oil instead of butter. Thanks again Laura for this recipe!! for at least an hour, but also over night is OK–and it works here. I imagine this corresponds to soaking when there isn’t enough liquid to do so. I’ve made them a few more times, never using the two parchments. I roll the dough on a pliable ‘slab’ (Tupperware) to exactly the size of the baking sheet. Measure this with one parchment, simply cut excesses off and place them where missing. It neither sticks to my rolling pin (ca 100y old, wood) or heavily to said slab. Place the parchment on the baking sheet. Quickly flip the slab onto it so that the dough lies EXACTLY in place. Gently roll the slab off, letting the dough fall onto the parchment–no tool needed. Admittedly, this requires fairly long, adults’ arms and large hands. I don’t allow my recipes to be printed on other blogs, but you are welcome at any time to link to specific recipes on my blog. Thanks – glad you like the recipes enough to share them! I have made these a few times, yum! My kids and my husband love them. So, I decided to try the chocolate version today. Do you have to add extra liquid? The dough seemed drier and crumbled easier. You shouldn’t have to add any, but it is worth a try to see if it turns out better. I really like this recipe and would love to make it buy I was wondering if there is anything else I could use in subsitute of sucanat? What are the measurements if I were to use brown sugar? Simply switch it out one for one in this recipe. Hi! I really want to try these out but have a few questions. Have you tried a soaked version by chance? Also, what about maple syrup, honey or coconut sugar in place of the sucanat? Also, what about using graham flour? I have tried a soaked version, using the melted butter and some buttermilk. It worked okay, but not great. I’d say try honey in place of the sucanat, and then maybe use extra flour if needed. I’ve never tried graham flour so I can’t say for sure on that one! Where do you find sucanat? I have agave and rapadura, but have never seen sucanat…that I know of. So which is the better substitute for sucanat-honey or brown sugar? And is it a straight substitution or do you need more/less of the substitute? I’d go with brown sugar, which would be a straight substitution. could you use maple syrup in place of the honey? How long do these keep? Would I be able to make the dough and freeze it to have on hand? Also, we are dairy free, would coconut or another oil work in place of the butter? Thanks. I love the recipes I find here! We are dairy free too and I made these with coconut oil (the expeller pressed kind without the coconut flavor). They turned out really good. I haven’t tried freezing the dough, but it could work. Good luck! Oh, that would be even better. I thought it might get soggy then, but if that works, fantastic! I love the looks of this recipe, but every cracker recipe I try disappoints when I try to store them. They’re all delicious the day of, but seem to go mushy when stored… Any tips for storing crackers? We just made these for he first time. My kids love to “help” in the kitchen so it was a good bonding opportunity as well. Jut curious how thin you roll your dough? Also does the amt of time I. The oven with it off dictate how crunchy they are? We used trivia + molasses to make a substitution for the sucanat. We used 3.5 tbsp of truvia and 1/2 tbsp of molasses to equal the sweetness of 1/2cup of brown sugar (a conversion I found online). They seem sufficiently sweet. Thanks for the recipe. Looking forward to using this in lots of ways! In your previous recipe for wheat thin crackers, you recommended not leaving the crackers in a turned-off electric oven to finish. Does this same advice apply for the graham crackers? My stove is electric. Thanks. It has 1/4 less sugar, 1/4 cup more flour and still tastes really sweet. I use Bob’s Red Mill Graham flour, white whole wheat flour in place of the AP flour and sustainable palm shortening. I like to roll my dough out on parchment paper and cut it out with cookie cutters. I never bother docking the crackers and I only bake mine for 10 minutes (per my oven). With 8 tablespoons of added sweetener and 30 crackers per batch (I never get my dough thin enough), that’s a little over 1/4 tsp added sweetener per cookie. So not too unhealthy. My kids LOVE them! So good! I finally made these for the first time yesterday, and the second batch is in the oven right now. I love them with a cup of tea. I used coconut oil rather than butter, and I had to borrow the pastry roller from my kids’ Play Dough tools (I washed it :) but they turned out great. What size is your cookie sheet? Laura uses a 14×18 baking sheet. I’m using a cookie cutter. Do I pull the shapes out before I bake or leave it as one sheet? Thanks! I’d probably pull the shapes out. I had the same problem. Mine were burnt and gross. I think I need less cooking time. Laura hasn’t had this problem. :( I am glad you were able to solve it though by reducing the baking time! I would like to get a mini pastry roller like your son is using, but I have not been able to find one. Do you recall where you purchased yours? This recipe sounds delicious!!! Can’t wait to try it! However, I’m wondering if there is any possible way to get around the butter? I’ve cut dairy out of my diet and am wondering if there is a non-dairy sub that would be suitable. Thanks for the encouragement in our kitchens to serve our families! You could use coconut oil instead of the butter and it should work great! I think I will try this soon ~ thanks so much! Laura, thanks! I made the chocolate variation and my 6 year old daughter helped me. Honestly, once they came out of the oven, I really did not think she would like them. Surprise! She asked for seconds. So happy to find a healthy snack alternative. I made a vegan version of these substituting the egg with a flax egg and they’re awesome!! I plan on using them for a cheesecake crust and cannot wait!